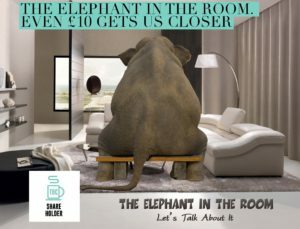 There is an elephant in the room about our Crowdfund ( bit.ly/TBCcrowdcube ) and I want to remove him, even though he is gorgeous (and note, no elephants were hurt during this post). First I want to thank all those here who have invested. We are now 13% towards the target. Money is not taken until (and IF) we hit the goal of £350k, so it is safe. I have received messages from people apologising for the small amount they have invested, Gail and I want to say to you that no amount is too small. Crowdcube allow anything more than £10 as a minimum. Also, any investment is an incredible leap of faith and belief in the concept. It is truly heartening when we refresh the page and see a name and that is what we notice first. I want to share a realisation I had recently. An amazing man, a business friend, launched his crowdfund about three years ago. He has kindly mentored Gail and I recently and continues to offer emotional support through this journey. When we talked the first time about our need for advice, I had to stop the conversation and address the fact I had not invested in his idea. I explained that Thomas and I were not in a position to invest what we felt represented our respect for him and his idea, so we chose to ignore. It was a lesson, three years on, that our contribution, no matter how small would have made a difference. We could have spared £50 for him and I now know how much difference it would. Crowdcube advise us that a typical trend is – one third of the money comes in from small contributions, in the £10s, a third in the 100s and a third in the thousands. This shows how important the mass £10s are! More than all of this, we want to be able to send you a Share Certificate and celebrate that you were all Founding Investors. If you think that I am a pain in the neck and should stop asking, then sorry, I can’t. We want this so much, we know the difference this will make, we want the community to be Shareholders AND I have now learned to ask (thanks to great mentoring in here), this means I can now also deal with rejection and the odd person being cross with me.